The topic says it all. Each year, we have an order topic and a review topic. "New" Yutaka Midori from O-Cha to kick things off. Leaf after 5 steepings is still beautiful green. 2nd steep ... actually greener than this photo. Really incredible in the cup, nice aromatics and wonderful taste of pure YM leaf. 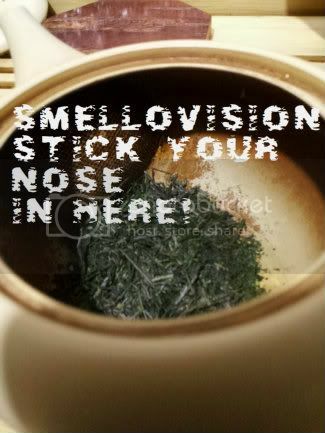 OHHH, do not forget the smell the dry leaves warming in your preheated kyusu for the "must sit down moment!" Vegetal, slight fruit undertone, full, satisfying flavor. Currently on third steep and it's surprisingly good for a third steep. I consider this a very, very balanced tea for some reason. It almost tastes like it was concocted in a factory, which isn't a bad thing. The balance is a virtue and a testimony of the skill of those who produced this tea. 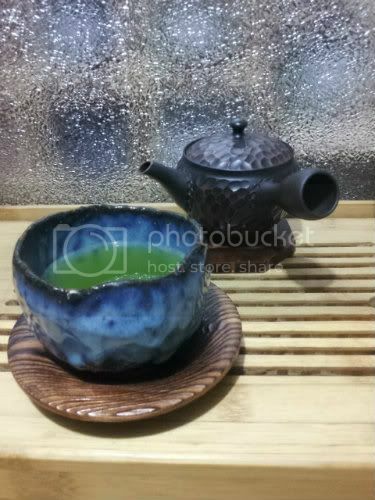 Water heated in a tetsubin (crystal geyser) tea prepared in tokoname kyusu. appearance: leaf is finely broken with some slender longer pieces, Dark green with bits of lighter green through out. 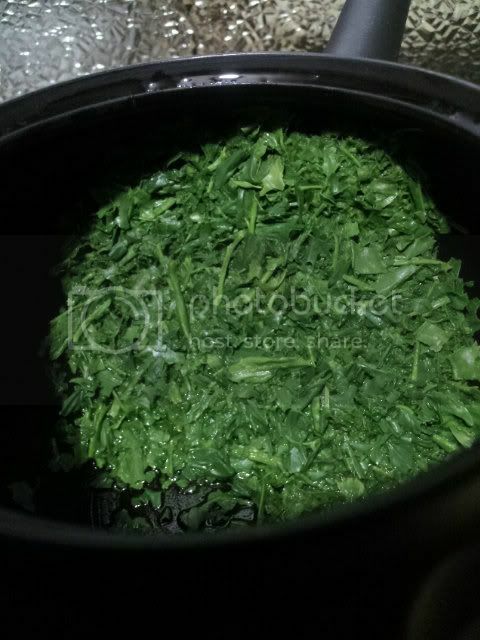 Smell of dry leaf: strong vegetal, briny - almost meaty like a beef and vegetable stock. appearance: a cloudy vivid green. flavor: green and fresh, savory/umami. strong and upfront with a deep finish, steamed asparagus. flavor: mostly sweet with a slight nutty taste in the middle, the sweetness is fine in the attack but cloys in the finish. coats the back of the throat in a syrupy way. some may enjoy this but I do not care for it. all profiles diminished past this point. This tea is very good to me but does not reach greatness. It actually tastes better to me the second day after having been opened, I also enjoyed it more brewed in a larger batch with some hotter water. around 75c. with organic and pesticide free fukamushi yutak midori available I will not be re-ordering this selection. I will not be re-ordering this selection. ... more for us then. Having had numerous YM selections over the years, IMHO, O-Cha consistently delivers the best each year. In fact, I conducted yet another side by side tasting of another shincha YM a couple weeks ago (which remains anon for now). I have had the organic YM you speak of, it was weak, thin by comparison. I would be willing to retry it, but we all know the rest of that story, don't we. I will agree with you on one point, it was better a day or two after arrival. YM is not high on my favorite list. I will not be likely comparing this to any other YM, though if I do feel the mood for one I will go with someone who does organic or one of the local tea people who get pesticide free tea. I prefer the taste of other fukamushi such as saemidori or okumidori. all that being said I still have bias to asa and chu over fuka. blairswhitaker wrote: all that being said I still have bias to asa and chu over fuka. Well, O-Cha *does* have some organic asa-s. (In fact, I am set to try a new one next week.) Unfortunately, they are out-of-stock right now, though the shin versions should be available soon. Pehaps you could try one of those. And, now that I think of it, Zencha has a couple of new Kago organic chu-s, as well as a few 2011 organic asa-s.
now I'm kicking myself for opening Chiran instead of YM. But the Chiran is great too Need another fuka to compare it with, as I'm not immediately picking up the supposed 'unique Chiran taste'. I still need to give it a proper quiet moment tasting but has my taste buds gone dumb? SilentChaos wrote: now I'm kicking myself for opening Chiran instead of YM. But the Chiran is great too Need another fuka to compare it with, as I'm not immediately picking up the supposed 'unique Chiran taste'. I still need to give it a proper quiet moment tasting but has my taste buds gone dumb? 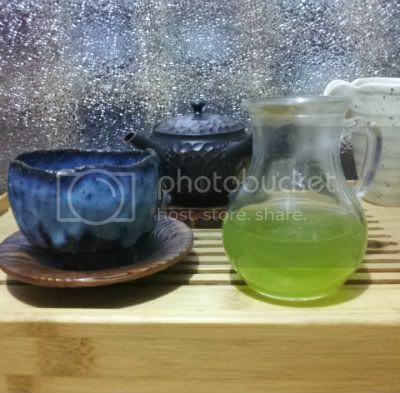 This was my own personal experience with sencha/ shincha, but I honestly felt it took me drinking quite a bit of sencha before I could completely taste the differences between them, even now I can be a little shaky if I am not fully paying attention. Sencha almost more so than a lot of other teas I personally feel that due to processing being somewhat standard across all of Japan ( with steam level the biggest difference), offers a rather consistent flavor that is foreign ( at least to those in the the West). This flavor is what strikes most people first, and the differences between Varietals require a whole different level of being aware of sencha, and its flavors. Not as "fuka" as some of Kevin's offerings in the past, plenty of needles! The colour of the dry leaf is stunning, especially against white porcelain, emerald green almost! - Started it last night at 69-70c but have raised it a bit this morning to 72-73 and had much better results. - Because I currently feel like brewing in larger amounts, I'm going with 7g in 230ml (8.1oz) of water. - Managed to get about 7 last night before the tea started to fade, impressive! Lots of big grassy notes but a little more refined than some more heavily steamed fukas. It's been a while since I've had any really good sencha, and this has reminded me of just why I first fell in love with Japanese tea! Will probably up this a little on my next session, still in Chinese Gong Fu mode somewhat!